Roux-en-Y gastric bypass (RYGB) is the most common bariatric surgery. The performance of ERCP in bariatric RYGB is challenging due to the long Roux limb. 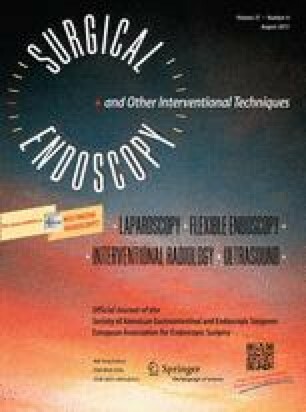 We herein compared the indications and technical outcomes of ERCP via percutaneous gastrostomy (GERCP) and double balloon enteroscopy (DBERCP) for patients with prior bariatric RYGB anatomy. Between December 2005 and November 2011, consecutive ERCP patients who had undergone RYGB were identified using a prospectively maintained electronic ERCP database. Medical records were abstracted for ERCP indications and outcomes. In most cases, the gastrostomy was done by either laparoscopic or open surgery and allowed to mature at least 1 month before performing ERCP. The choice of route for ERCP was at discretion of managing physician. Forty-four patients (F = 42) with GERCP and 28 patients (F = 26) with DBERCP were identified. The mean age was younger in GERCP than DBERCP (44.8 vs. 56.1, p < 0.001). GERCP patients were more likely to have suspected sphincter of Oddi dysfunction (77 %) as the primary indication whereas DBERCP was suspected CBD stone (57 %). The mean total number of sessions/patient in GERCP and DBERCP was 1.7 ± 1.0 and 1.1 ± 0.4, respectively (p = 0.004). GERCP access to the major papilla was successful in all but two (97 %), whereas duct cannulation and interventions were successful in all. In DBERCP, the success rate of accessing major papilla, cannulation and therapeutic intervention was 78, 63, 56 %, respectively. There was one (3.1 %) post-ERCP pancreatitis in DBERCP. Complications occurred in 11 GERCP procedures (14.5 %) and 10 were related to the gastrostomy. This was significantly higher than that of DBERCP (p = 0.022). GERCP is more effective than DBERCP in gaining access to the pancreatobiliary tree in patients with RYGB, but it is hindered by the gastrostomy maturation delay and a higher morbidity. Technical improvements in each method are needed. An erratum to this article can be found at http://dx.doi.org/10.1007/s00464-013-3129-7.